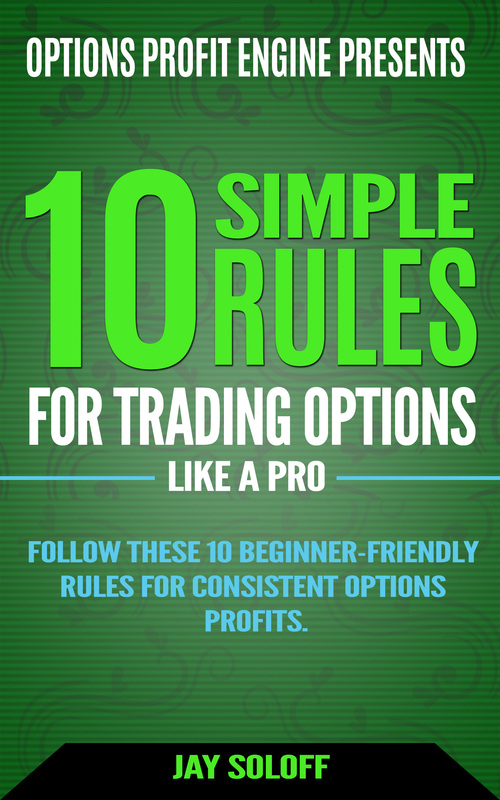 Trading market volatility can very profitable because it tends to be more predictable than picking market direction. Yet, volatility trading can also be risky because of its tendency to make big moves on very short notice. Both February and October of 2018 are good examples of this scenario playing out. Still, one volatility behavior you can be sure of is “what goes up must come down”. Very much like attempting to defy gravity, volatility can’t stay at high levels for very long, unless there’s an epic amount of uncertainty in the market (like in 2008). In most other situations, you can expect market volatility to mean revert within a few weeks (and sometimes days). That’s a predictable pattern that we can take advantage of as options traders. 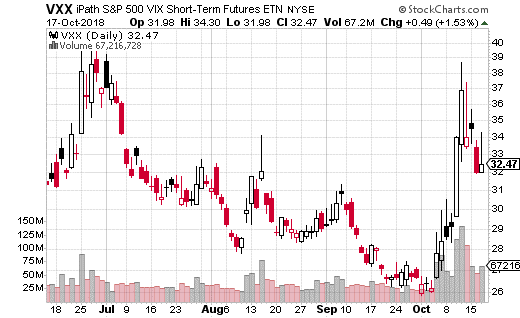 But don’t take my word for it – just look at this huge options trade which was recently executed in the iPath S&P 500 VIX Short-Term Futures ETN (NYSE: VXX) which I discuss below. By the way, VXX tracks short-term volatility and is one of the most popular ways to trade volatility. With VXX at $32.71, a trader bought 19,000 November 16th puts at the 30 strike while simultaneously selling 38,000 28 puts and paid just $0.02 for the transaction. This is called a ratio put spread (because it’s a 1 by 2 ratio – selling 2 28 puts for every 30 put purchased). It’s a trade often used by professional traders as it greatly reduces premium costs (but can significantly increase risk). If the trader just purchased the standard 28-30 put spread in November, it would have cost $0.87. At 19,000 spreads, that amounts to $1.7 million in premium. However, by selling an extra 28 put (for $0.85) the spread cost gets down to just 2 cents (not including trading costs) or a mere $38,000. Meanwhile, If VXX closes at $28 on November expiration, the trade makes $1.98 in profits or $3.8 million. That’s a 9,900% return (because the cost is near zero). On the other hand, the strategy has extremely high risk below $28. For every dollar below $28, the trade is short 19,000 puts, or $1.9 million. While that seems like a crazy amount of risk (and I don’t recommend this type of trade for non-professionals), it’s not as bad as it seems. Keep in mind, there’s a floor on how far volatility can fall in a short period of time. For those of you who want to bet on volatility mean reversion in VXX, this is what I’d suggest instead: buy the November 9th 27.50-30 put spread (buying the 30 put and selling the 27.50 put) for about $1 (VXX at $32.50). Your max loss is only the premium paid, but you can earn $1.50 in profits. We’re trading one week of time (compared to the trade we just discussed) for an extra $0.50 of profit potential and very limited risk. Even though we are chopping off an extra week, by November 9th expiration, we’ll already know the results of the mid-term elections and the FOMC meeting. As such, I would expect to see volatility dissipate even further. Best of all, you can only lose the $1 you spend on the put spread – a very reasonable amount when you’re buying an ETF that mostly goes down.